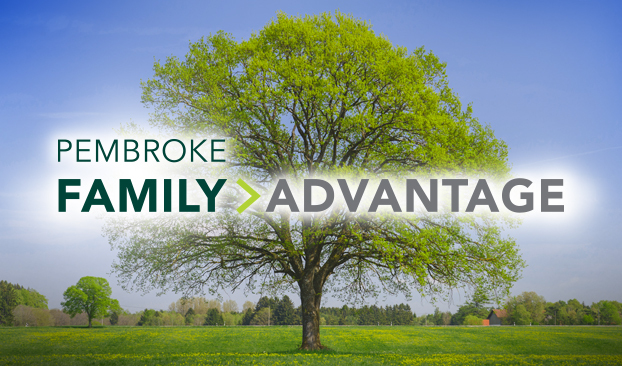 As we celebrate 50 years of serving the investment needs of our clients and their families, we are pleased to announce the Pembroke Family Advantage Program. The Program enables you to extend many of the Pembroke benefits that you enjoy to virtually all members of your family. Benefits include using the combined value of family holdings to determine management fees. Now daughters and sons, nephews and nieces, brothers and sisters, life partners, grandparents and other family members can all benefit from their combined account size regardless of their age or address. This innovative approach exceeds industry standards and will benefit many of our existing clients. One conversation is all it takes to learn more about Pembroke Family Advantage and to get started. Contact your Pembroke Representative today.